In 1891, Oscar Wilde defined 'the highest criticism' as 'the record of one's own soul, and insisted that only by 'intensifying his own personality' could the critic interpret the personality and work of others. This book explores what Wilde meant by that statement, arguing that it provides the best standard for judging literary criticism about Wilde a century after his death. Melissa Knox examines a range of Wilde criticism in English -- including the work of Lawrence Danson, Michael Patrick Gillespie, Ed Cohen, and Julia Prewitt Brown. Applying Wilde's standards to his critics, Knox discovers that the best of them take to heart Wilde's idea of the aim of criticism -- 'to see the object as in itself it really is not.' By this, Wilde appreciates Walter Pater's profound observation that everyone sees through a 'thick wall of personality' and that, therefore, objectivity as conceived by Matthew Arnold does not exist. Admiring Pater, Wilde became a prophet for Freud, his exact contemporary. Their intellectual sympathies, made obvious in Knox's exegesis, help to make the case for Wilde as a modern, not a Victorian. 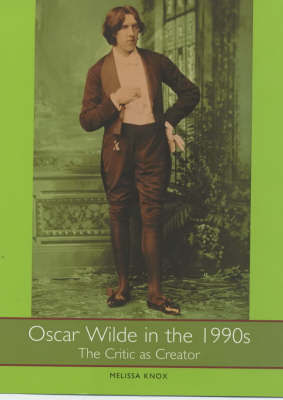 Melissa Knox's book Oscar Wilde: A Long and Lovely Suicide was published in 1994. She teaches at the University of Duisburg-Essen, Germany.